On the way home from our walk, I just happened to spot this little shell on the road. The path is next to this big lake near my house, but it's somewhat elevated and behind a fence. So this little guy must have traveled quite a way. Aw, looks like a baby. He seemed a bit lethargic, so we decided to put him in a nicer spot, down by a small creek. We put him next to some water and he perked up a little bit and went for a dip. We felt a little reluctant to leave, but what were we gonna do - sit around and babysit this turtle? We walked back that way later that day and we was gone. Guess he swam away? And that was my grand Golden Week adventure. Then I found $40 and it was the best birthday ever. The end. You fool! The proper protocol when you find an animal in japan is to cram it in a tiny little ball and force it to fight other animals. And sorry, wasn't actually my birthday. Just wanted to end my story on a high note. Turtle rescue gives you a + 2 on your Karmatic rating! Good job. That might be enough to reincarnate as some kind of primate. Level up! So, did you really find a note (1,000yen, was it)? No, that was a lie, too. Guess I kind of missed my mark there. Many of my friends back home have this kind of...technique, I guess? When you tell a story that you think will be interesting but then either fails to impress the audience or in retrospect you think to yourself "Ah, guess that wasn't such a great story," you add something onto the end like "then I found $40 and it was the best birthday ever" or "and then I became skateboarding champion of the world." Kind of just a little non sequitur, sorry. I was just about to wish you a happy birthday haha. 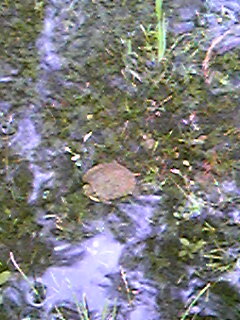 Your eyes must have been really sharp to spot such a tiny turtle. SUPER ADORABLE. Also, props to the Pokeball. I think the problem with the joke is that finding $40 on your birthday is so plausible. When I first read it, I thought "geez, just how many friggin' birthdays does this kid have this year?" Fun fact: turtles carry salmonella. Hope you scrubbed up afterwards. Haha...$40 isn't so easy to find in J-town, though. Good to know about turtles, though. Those little jerks. 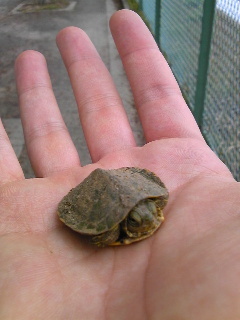 My pet turtle is bigger (and cuter ;) ).